previously OACRS.... Find out all the information here! WE PROTECT YOUR PRIVACY ! Does your child need speech? Is your child on the waitlist and you need some resources while you wait? A community-based children's rehabilitation centre serving the counties of Hastings and Prince Edward. 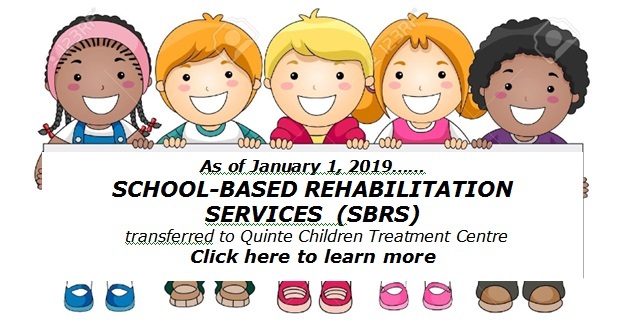 At the Quinte Children’s Treatment Centre we provide a range of rehabilitation services and programs to children and youth with multiple disabilities, residing in Hastings and Prince Edward Counties. Each child is viewed as part of a larger network, with home, school, hospital and community partnering to establish goals and produce change. Our centre will serve as a primary resource for information and advocacy in our community. Our goals is to assist each child and their family to reach their potential and to participate as fully as possible in the life of our community. As a QCTC patient, you can expect that your privacy will be respected. We take steps to protect your personal health information from theft, loss, unauthorized access or use.